Due to colder then normal night time temperatures over the last two months, our Green Giants were not able to have their first growing spurt of the season. We wanted to let you know that the plants are in great shape and can be planted. They are just not the height that we normally offer. If you decide not to have your order shipped at this time you can reserve the larger plants after their growth sprurt, for this coming fall. We are very sorry for any inconvenience this may have caused. This is the most perfect hedge of Green Giants we've seen to date. Thuja 'Green Giant' is one of the fastest growing of all Conifers. This very rare hybrid between Western Red Cedar plicata and Thuja Standishii Cedar will put on 3 to 5 feet of growth per year! Elegant and uniform, Green Giant's conical habit needs no shearing or pruning, and is cloaked in dense, dark, evergreen foliage clear to the ground - a stunning choice for a private screen. Will enhance property values while screening unsightly areas year-around. And this is a tough, easy plant to grow, tolerating almost any soil and resistant to damage from ice and snow. Green Giant is able to withstand drought well, exhibiting no significant pest or disease problems, and is highly deer and bagworm resistant! 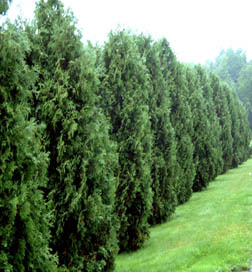 Green Giant will become the outstanding alternative screening-evergreen to the disease prone Leyland Cypress in the south and to the Hemlocks that are dying throughout New England. Plant 5 to 6 feet apart for a really fast privacy screen, otherwise 10-12 feet apart. Most vigorous growth will be in full sun, but it will also perform well in light shade. Eventually reaches 30 to 50 feet tall. Zones 5-9. "These are being shipped bare root 8-16' " Some might be shipped in 2 1/4 inch pots it depends on what avail at time of shipping. Fall planting on the green giants for zones 4-5, no later then September 1st. Zones 6, No later then October 15th. Zones 7-8 all winter. Spring planting on green giants for zones 6 no sooner then March 15th. Zones 4-5 After April 15th. EMAIL US FOR BULK PRICES!